The delicate inner workings of a mechanical watch handle magnetic fields—especially those generated the industrial electromagnets used in hospitals and power stations— about as well as two liters of Diet Coke handles a tube of Mentos. That is, not well. And when exposed in the massive fields generated in research institutes like CERN, that watch is liable to fly clean off your wrist. So beginning in the late 1950's Rolex developed the Rolex Milgauss, a watch with a built-in Faraday cage of non-ferrous metal surrounding the magnetically vulnerable movement. The design was nothing less than revolutionary, able to withstand 1000 Gauss without damage, and remained the standard in timepiece magnetic counter-measures for the next six decades. 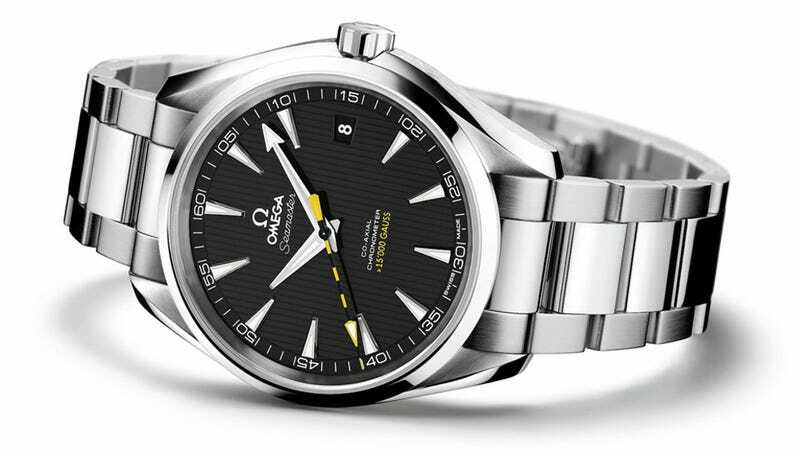 However, Omega has taken the Faraday cage concept to its logical conclusion with the new Seamaster Aqua Terra watch. Touted as the world's first fully anti-magnetic watch, the Seamaster AT's movement is constructed completely out of non-ferrous material. This imparts a staggering 15,000 Gauss resistance to magnetic fields—sturdy enough to be worn even in CERN itself. Omega hasn't announced pricing yet but should begin shipping later this year.